A criminal is coming to town (to steal your ID). That’s why Santa has purchased a certified ‘Secured by Design’ letterbox from Postbox Shop, currently on offer! Santa is so busy at this time of year supervising his Elves making wonderful toys in his Workshop, for all those good girls and boys. He was worried though, he mused, what I need is a secure post box to receive all the children’s Christmas list letters. No, Royal Mail warned him that there are nasty people out there who want to steal your mail and your identity. Steal Santa’s identity? That would be a disaster for children throughout the world!!!!! Santa leapt into action. He scoured the Internet to find a secure letterbox or security box to protect his valuable letters and decided to purchase this secure by design letterbox. The DAD009 is the UK’s first and only Certified Secured By Design Letterbox. Made from electro-galvanised steel and powder coated in Grey (other RAL colours are available). This model is designed to be surface mounted, recessed or freestanding and provides the highest resistance against vandalism and mail theft attempt. It is currently the only letterbox complying to the New Homes Guide 2014 released by Secured By Design. With Christmas just around the corner, it's time to start sending your letters to Father Christmas. We'll deliver all of your letters to Santa Claus himself, and if you get your letter to him in time, he's even promised us he'll reply! 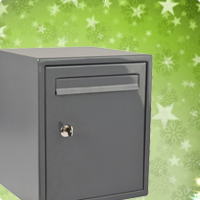 Be sensible just like Santa, buy your security box today, from the Postbox Shop…you know it makes sense!